Grand Theft Auto V has hit the Big Billion mark faster than any other entertainment property in history. It's not the most surprising news of the day, given that Grand Theft Auto V covered most of the ground on its first day of sales, but now it's official: From zero to $1 billion in three days, making it what Take-Two believes is the undisputed king of the billion-dollar drag race. 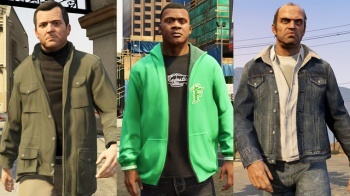 "Grand Theft Auto is a cultural phenomenon and Rockstar Games continues to redefine what can be achieved in interactive entertainment," Take-Two Chairman and CEO Strauss Zelnick said in a statement. "We are incredibly proud of the extraordinary critical and commercial response to Grand Theft Auto V."
Bear in mind that GTA V isn't just the king of the videogame castle, but is lord and master of all it surveys. It took the previous videogame record holder, Call of Duty: Black Ops 2, 15 days to do a bil, while the blockbuster film The Avengers took 19 days, according to Filmonic - more than six times longer.